During the spring term we decided as a department to develop a Scheme of Work that would prepare our Year 9 students more effectively for the demands of the new GCSE course. We delivered the lessons around the time of options choices to give the students a realistic idea of what GCSE geography would be like. The Scheme of Work that I developed focused on China and included topics such as their expanding population, China’s growing economy, their position as a future superpower, environmental problems, and sustainable development. The first lesson introduced the students to China and they first located China using an atlas. The next task was to decide whether a series of photographs were of China to help them understand the variety of landscapes found in China (e.g. deserts, mountains, karst topography, and cities). They finally completed a map of China from memory in teams, including a range of physical and human features.. The second lesson introduced students to key population terms and how to display population density as a 3D map using small building bricks. They then compared their 3D maps to a choropleth map and discussed how a choropleth map could be constructed, before creating their own key and completing a choropleth map of their own. This helped the Year 9 students to appreciate that GCSE geography includes a number of skills. This lesson then led into the next about China’s one child policy. In a lesson focused on China’s economy, the students were instructed to use the hexagons seen in the picture to the right to explain why China’s economy has grown so quickly. All of the students linked the hexagons to show which reasons could be used together and some wrote their reasoning next to them. If I was to use these hexagons again, I would link it to the chains of reasoning needed in the extended GCSE exam questions. One of my favourite lessons in the Scheme of Work asked the students to investigate China’s status as a superpower. Students were asked to consider what a superpower might be and what characteristics a superpower would have. They then used tablets to find the answers to the questions in the table to the right. Every student in my class was eager to research the questions and enjoyed the task of evaluating China as a superpower. The evaluating skills used in this task are needed at GCSE to answer the extended exam questions. Perhaps after this task you could ask students to answer a practice exam question using their research. 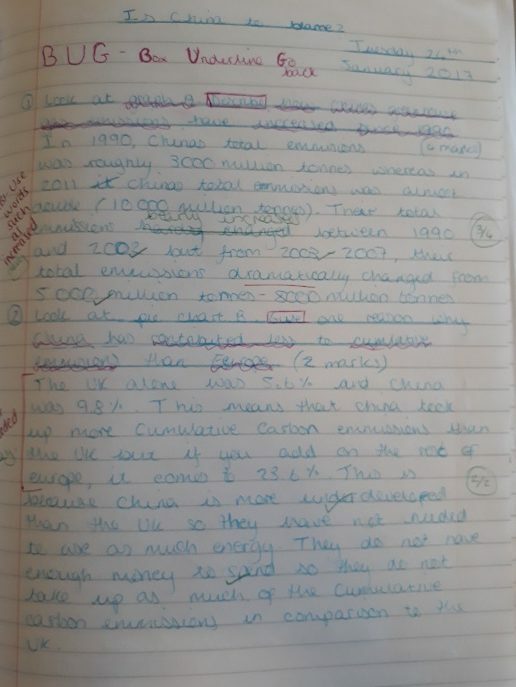 Another lesson asked students to consider whether China is to blame for the increasing amount of CO2 emissions using a series of graphs and exam-style questions. This was the first opportunity for many of our Year 9 students to tackle a GCSE-style question and use exam techniques that we use in Year 10 such as picking questions apart. For example, they answered one question, ‘Look at graph A. Describe how China’s greenhouse gas emissions have increased since 1990. (4 marks)’. Many were asking how to achieve full marks and were interested in the technique. The challenge of knowing that it was GCSE work motivated a lot of our students and I have noticed a similar reaction when I tried the same with my Year 8 classes. They needed more support with picking the question apart but relished the challenge of trying something a bit harder. 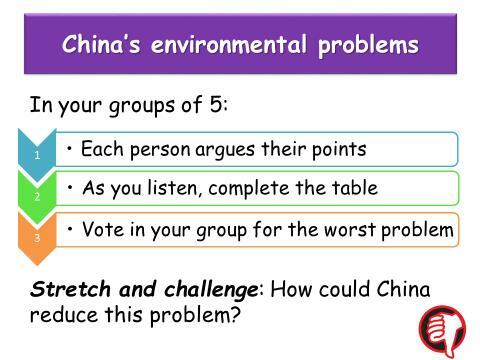 The final few lessons focused on the environmental problems where students completed a group task arguing why their problem was the worst (see slide below for instructions). This allowed the groups to hear about the different environmental problems and practise their arguing skills needed when evaluating. They then used this information to consider the following question, ‘To what extent do you think the policy of ‘grow first, clean up later’ has been successful in China?’. Many of the students thought that China should have to clean up now but when challenged over what the UK has done in history were left a little more confused. The final lesson focused on using the sustainable development goals to assess the Dongtan in China. Throughout students were encouraged to think about China’s development issues and how they have responded to them. The aim was to develop the evaluation skills that are so important for the new AO3 exam questions. I developed the assessment from GCSE-style exam questions including a mixture of shorter response questions and describing locations/distribution. The biggest question was a decision making task based on what China’s government should focus on in the future; should they focus on how China will produce its energy or how China will solve its water crisis? The students were given a resource booklet with a range of sources including graphs, maps and viewpoints to use as evidence in their answers. The students aiming for full marks had to link together their knowledge of China to show they were ‘thinking like a geographer’. As a Scheme of Work based on GCSE lessons and textbooks I was surprised to see that this topic came out as the favourite in Year 9 in a student survey. Perhaps they enjoyed the fact that they were being challenged and encouraged to step out of their comfort zone. Students also seemed to enjoy studying a country in more detail and the mixt of physical and human geography. I would be interested to hear how you have been adapting KS3 Schemes of Work to prepare students for the new GCSE specifications. ← Can digital learning create an inclusive classroom that combines diversity and awareness? Very good unit already written on G A website &RGSWebpages..